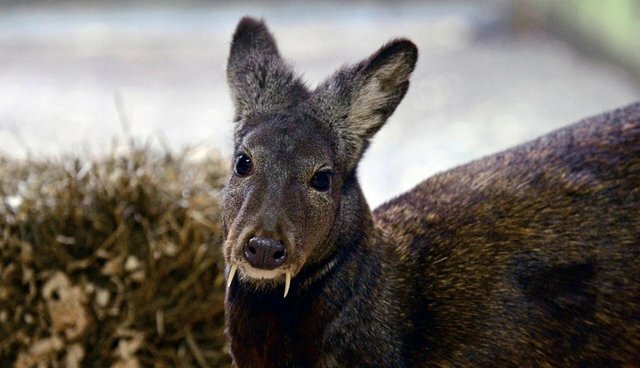 A rare species of deer, whose perhaps most distinctive feature is its pointy, vampire-like fangs, has been rediscovered roaming in the wilderness of Afghanistan more than half a century after last being spotted. According to the Wildlife Conservation Society (WCS), a survey team confirmed seeing the elusive animals, called Kashmir musk deer, on five separate occasions in Afghanistan's rugged northeastern corner. But like the mythical, bloodsucking beings they bear an uncanny resemblance to, researchers say the deer were "cryptic, difficult to spot, and could not be photographed." Nevertheless, the finding comes as welcome news that the species, which had last been documented by Dutch scientists in 1948, continues to inhabit the region despite persistent threats. Little is known about Kashmir musk deer, whose range includes parts of India and Pakistan, other than the fact that they are in decline. The IUCN lists the deer as "endangered," estimating that their population has dropped by 50 percent in just over 20 years. The animals have been hunted in excess for both their meat and their namesake musk glands, which are traditionally believed to have medicinal qualities. But now with the confirmation that Kashmir musk deer are indeed still active in Afghanistan, it shows there's still time to protect them for future generations. "Musk deer are one of Afghanistan's living treasures," Peter Zahler, WCS deputy director of Asia programs said in a release. "This rare species, along with better known wildlife, such as snow leopards, are the natural heritage of this struggling nation. We hope that conditions will stabilize soon to allow WCS and local partners to better evaluate conservation needs of this species."